We all know that the store brands can be less expensive than the national ones. Yet sometimes you end up sticking with national brands because you know what to expect, but what if the store brand ended up costing less and tasting better? The other day I headed over to my local Smart and Final. It is a great place to do all of your one stop shopping. You can get everything from produce to meats. Smart & Final does carry the warehouse size items with no club fee, so this makes shopping easy, less expensive and less overwhelming than shopping in than a big warehouse store. 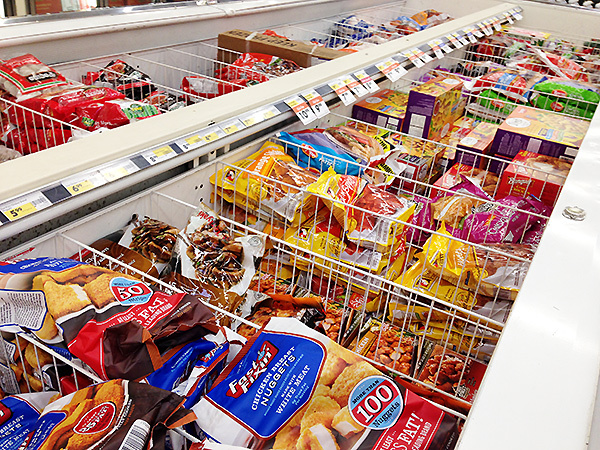 It is a perfect place to shop for all your grocery shopping needs. 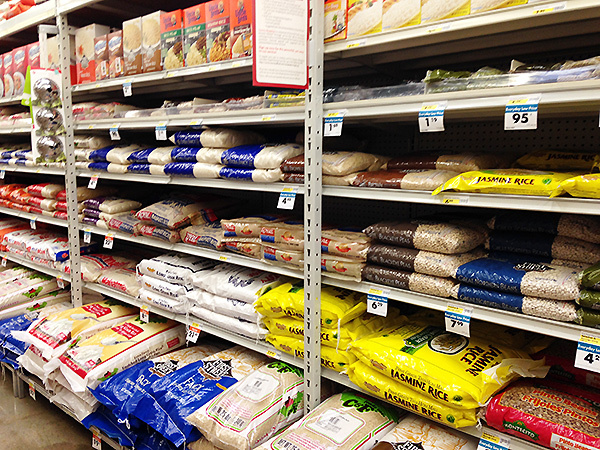 Aisle at my local Smart and Final where I found the rice. 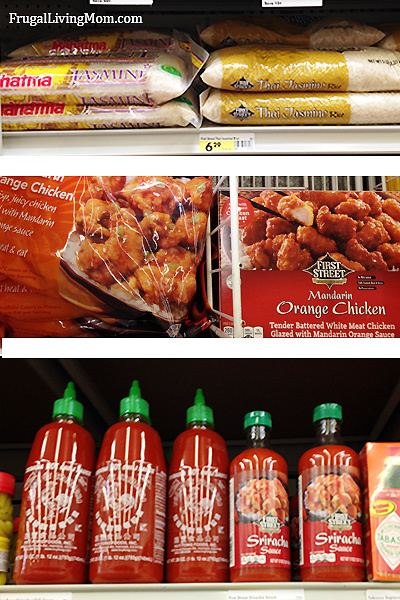 I was picking up some items to do a taste comparison and recipe with First Street Mandarin Orange Chicken (22 oz) vs Yang’s Chicken Mandarin Orange, First Street Thai Jasmine Rice (5 lb) vs Mahatma Jasmine Rice and First Street Sriracha Sauce (17 oz) vs Huy Fong Sriracha Hot Chili Sauce. 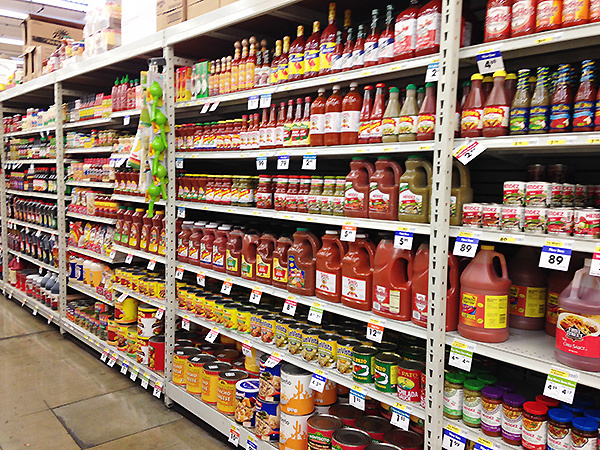 Aisle at my local Smart and Final where I found the Sriracha. 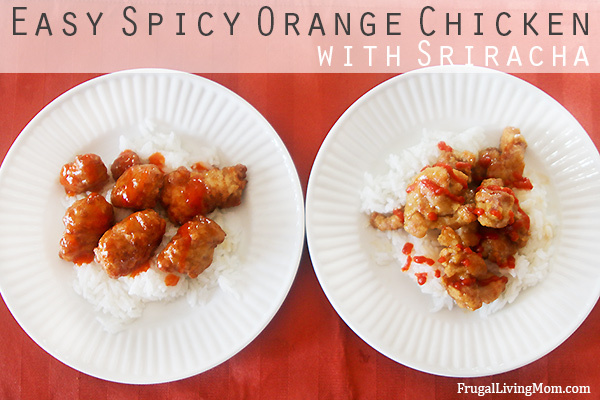 I made an Easy, Spicy Orange Chicken with Sriracha to test the First Street Brand and the national ones. This is a SUPER easy dinner ,and as a great perk it only runs $1.41 a serving made with the First Street Brand Products. That is a pretty awesome price compared to take out and even saves a little over the national brand price of slightly over $1.70 a serving. Aisle at my local Smart and Final where I found the chicken. It was a snap at Smart and Final to pick up all my ingredients, including a treat of a 4 pound flat of strawberries for only $4.99, YUM! Then I came home and made the meal. The first thing I noticed about the First Street Mandarin Orange Chicken was how big the chicken pieces where compared to the Yang’s Chicken in Mandarin Orange. Not only that but the color was a nice brown vs a lighter color. The First Street Thai Jasmine Rice and the Mahatma Jasmine Rice were very comparable. I did not really see a difference in taste or texture, but I did like that the First Street Brand cost less ($.04 less a serving). I have never had Sriracha, so that was a new experience for me. The First Street Sriracha Sauce was thinner and less spicy while the Huy Fong Sriracha Hot Chili Sauce was much thicker and hotter. Sriracha traditionalists might like the Huy Fong Sriracha better, but to me I liked the less spicy. I baked the chicken, according to the package instructions and prepared the rice (TIP: let your rice cool for just a few minutes prior to fluffing and serving, I find it fluffs better). After baking I still felt the First Street Brand had a more appetizing look than the Yangs. And plating with all the products both my husband and I thought that the First Street Brand meal had an overall better look. 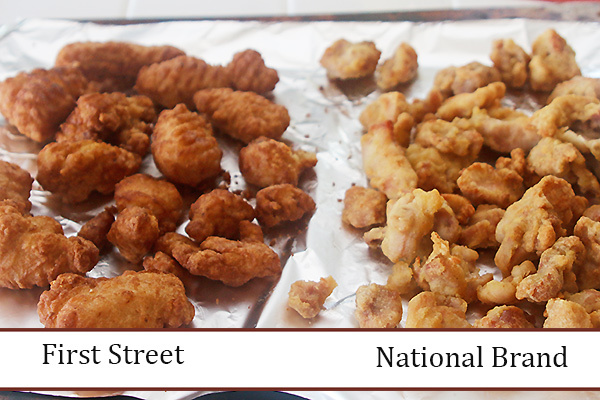 My husband was my taste tester (I am mostly gluten free) and looks told the truth, the First Street Brand meal was considerably better than that of the national brand. He thought the First Street Mandarin Orange Chicken was juicier and the First Street Sriracha Sauce was not as hot (which he preferred). I like how the First Street Sriracha Sauce looked on the chicken. Because it was thinner is simply looked more appealing. The winner!! 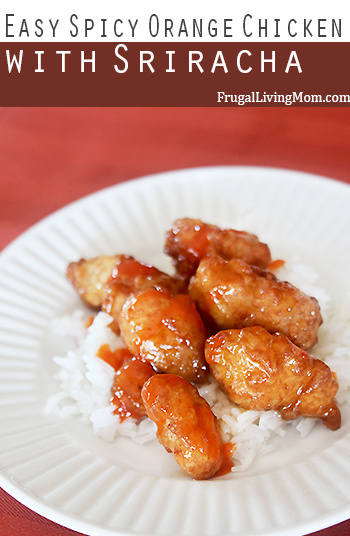 First Street Brand Easy, Spicy Orange Chicken with Sriracha. Find more recipes in the Smart and Final Social Circular. 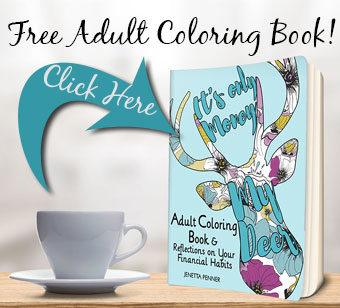 And follow Smart and Final on Twitter and Facebook. While your chicken is cooking bring water to a boil in a medium sauce pan. Remove from the heat, keep covered and let rest for 5 minute. Fluff with a fork and serve with chicken. Drizzle the meal with First Street Sriracha Sauce to taste. I tried you Orange Chicken Sriracha test and completely disagree. Smart n Final chicken is plumper because is has so much more breading and the darker color means it was fried in oil longer. You are comparing SnF with white meat with Yangs with dark meat. Dark meat ALWAYS has more flavor. Hands down the Yangs is a better product.